April 29, 2018 update: to order Baskets of Time, please go to Home & Away’s website by clicking here. Click or tap here to see a TV clip about Maine Indian baskets, including Baskets of time. 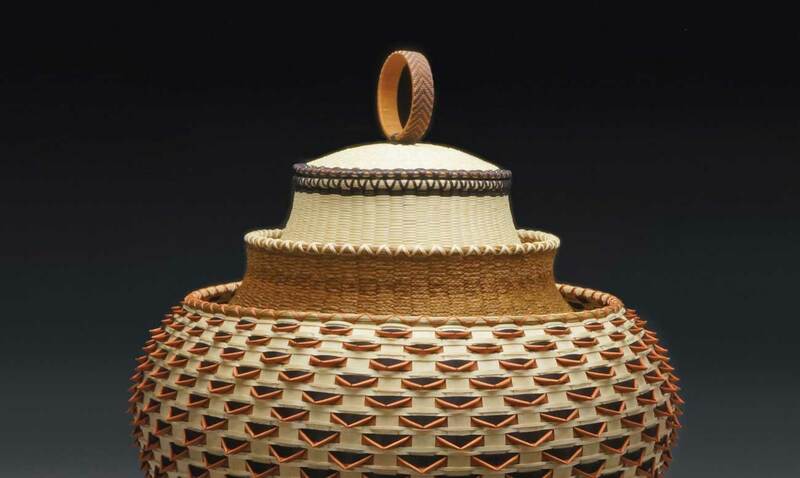 By the early 1990s, the art of Wabanaki basketry was considered nearly extinct. Today it is a recognized as a vibrant and evolving form of Native American art. What saved this important art form from extinction? The imagination, hard work, and generosity of a core group of elders who had kept the tradition alive, along with the Maine Indian Basketmakers Association. Baskets of Time shares the stories of seventeen artists and families. Each profile describes how the artist learned the art of basket weaving from individuals within their family and from other tribal members. In their own words, they describe how they transform such raw materials as sweetgrass and ash into beautiful baskets that have become award-winning works of art sold in galleries and exhibited in museums, including the Smithsonian’s National Museum of the American Indian. Gretchen Faulkner, Director of the Hudson Museum at the University of Maine, has written an essay in which she provides the historical background for the tradition of Maine Wabanaki basket making–and the important role the art form played in the past and still plays today in the lives of in the Passamaquoddy, Penobscot, Maliseet and Micmac tribes. Baskets of Time is beautifully produced book that is fully illustrated with color photography of each artist and their work. It will appeal to collectors of Native American basket making; to people who are just discovering basketry art; and to those who are interested in learning the story of how an ancient Native American art form has been not only saved from extinction but also imbued with the energy and creativity of a new generation of Wabanaki artists. To order the book, please go to our sister website, Home & Away by clicking or tapping here.